I didn't realize I had to specify this wasn't a birthday present. Later that evening when I asked him if he picked up some seeds everyone looked at me disgusted... "Why are you asking what we got you for your birthday." Mental Note: when sending him out for future errands don't confuse him with two different things to be done. One thing at a time. Sigh... after seven-years of marriage I am still learning how to communicate with my husband. Oh well. The seeds and necessary tools were a wonderful present the next day. They will last the whole spring and summer season (and into winter as I enjoy freezing some of our vegetables, too). Back to my minute out the norm topic: Every year I get a seed starter / greenhouse tray and the boys help pick out what we want to grow that year. We don't have a huge vegetable-garden. It is probably 2ft by 10ft. Just big enough that we can plant 3 or 4 different vegetables. I have a different part of our garden devoted to my favorite thing to grow, herbs. So today we started our 'gardening season'. The boys and I pulled out our seed starter & we put two seeds in each pod. We talked about what we were growing, how the plants will need sun and water to grow, where the seeds came from. It was a great scientific conversation as we put each seed in. It certainly got their minds spinning! After the seeds were in the pods (I don't even really cover them with dirt - just gently push them down) we put the tray lid on and set them on a bench in my kitchen next to the sliding glass door. It really is the sunniest place in the house. 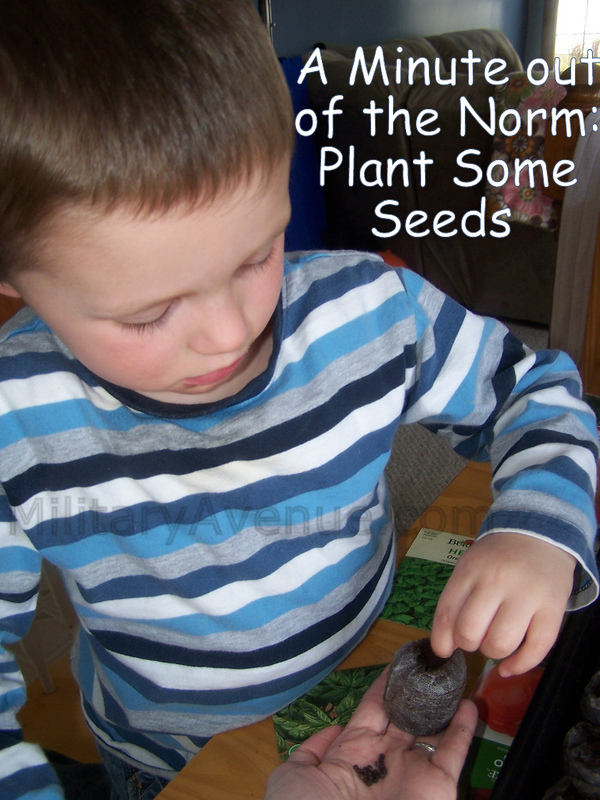 I look forward to checking out how the seeds are looking with my preschoolers. As they go from seed, to plant and then in about two months we can put them in the ground outside and really start to enjoy the fruit of our labor. A small simple garden doesn't take too much time and it is such a great learning experience for young ones. I would highly encourage everyone (green thumb or not) to plant something this spring with their children! It is a wonderful diversion for the day and the weeks to come. PS... MilitaryAvenue.com has many categories of military-friendly businesses, including "Greenhouse & Nurseries" which would have the gardening products you need to start your first garden. Find your installation and click on "Home & Garden" on the left. Greenhouse & Nurseries and many other related military-friendly businesses are listed for your convenience. Great photo - showing how hard you have to concentrate when planting seeds!